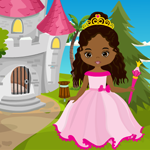 Games4King - G4K Cute Queen Escape is another point and click escape game developed by Games 4 King. In a beautiful and magnificent city there was a wonderful fortress. A cute queen lives in that city. That cute queen was very beautiful to see. That cute queen was unexpectedly stuck in the fortress there. It is your duty to save the cute queen from that fortress. It will help you find the hidden clues in which to save the cute queen from there. Find all the tricks and save that cute queen from the fortress and congratulate you to win the game. The tricks of the trick are a little harder to find, but somehow it may be a matter of interest. This game is highly desirable. Good luck and have a fun! I found and used: the barbecue fork, key, wing clue, object clue, and 5-digit code. Missing: one hat, one candy, one fruit bowl, and two seashells. Made it just out. I was lucky enough to start trying the knife on the left side of the left scene (working over to the right) and needed only a few clicks. Tramserran, those things you need come at the end and lead from one to another, and yes, you need a hammer head, also more at the end. Do you have anything else in your inventory? sneaky candy in knight's helmet. Wait, there's a total of five shells, and I could swear I got three at one go. Let me check where the other were, it was earlier. Once I found the sneaky candy, everything else fell into place. I helped the Cute Queen escape. YAY! Took me a bit to find that last piece of candy too! Thanks Tramserran for the hint. I swear i beat up all those knights LOL Thanks for the game G4K Team! Where is the fork used?